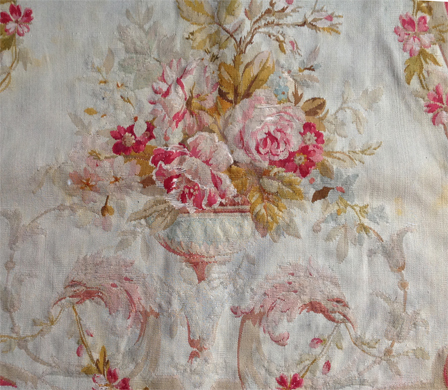 Ariadne is an archive of design artwork and antique textiles. Some limited edition patterns are available as cloth. This extraordinary collection of designs represents the work of the artist Roger Woods, who worked using traditional methods to produce large scale complex designs for textiles and wallpapers. These are now being made available under license. For patterns available as cloth please see our In Stock page. The site is in under construction but will include our full catalogue of designs and of our collection of antique textiles. These will be viewable online on application for a password. Ariadne has been designing and producing furnishing fabrics since 1986, using traditional methods of textile design, working in watercolour and gouache which gives the final product a fine depth and subtlety. Our influences come from paintings, period furnishing, our own archive of antique textiles and an extensive art and design library. Roger Woods 1945-2002 was a gifted fine artist who loved interiors. His exquisite touch and subtle colourings gave his designs their unique quality. Simone now manages both archives and would love to speak to you about your project, whether you need a bespoke design or would like some of our limited edition of fabric, or to discuss licensing. Ariadne produced a highly successful collection of period designs with a subtle, rich, muted palette and a tea-stained background in the mid eighties. For many of our customers, nothing else will do. We have worked with a number of major UK and US companies. There's nothing like the feel of antique linen, or the weight of a tapestry, or a printed woven textile, or the beautifully modulated palettes .These have been an inspiration for all our design work. When the catalogues are complete you will be able to view them online if you apply for a password. Above are some examples of designs and the antique textiles which inspired the colour palettes. You can find us on Pinterest and we have just started an Instagram page.